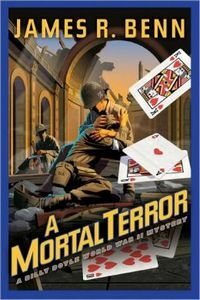 A Mortal Terror by James R. Benn, a Mysterious Review. Review: January 1944: On leave in Switzerland from his post as a military investigator, 1st Lieutenant Billy Boyle is ordered to Naples, Italy, to look into the murders of two US Army officers in A Mortal Terror, the sixth mystery in this series by James R. Benn. The first man, Lt. Norman Landry, was found in the 3rd Division bivouac area at Caserta, just outside of Naples. His body was found behind a supply tent, his neck snapped, a brand new playing card showing out of his shirt pocket: the ten of hearts. There were no other cards near the body. The second officer was Captain Max Galante, M.D., of the 5th Army medical staff. His body was found the same night outside headquarters at Caserta, strangled. A playing card was also sticking out of his shirt pocket: the jack of hearts. To Billy, these cards were sending a message from the killer. Higher ranking officers were next on his list. The mysteries in this series have been uniformly outstanding, and A Mortal Terror continues this fine trend. They are typically not simply whodunit-style murder mysteries, but often involve a personal element. In this case, it is Billy's younger brother, Danny, who has joined the Army Special Training Program at his college. And Danny has been assigned to a platoon in Caserta, arriving just after Billy. But concern for his wildly inexperienced young brother has to take a second place to his duty to solve these murders. What do the dead men have in common? Are the playing cards a ruse, to divert his attention from the next target? Or if not, will he be able to figure out what they mean and prevent another officer from being killed? As a character, Billy Boyle is true to his faith, his family and his country. Benn has a unique and sensitive way of incorporating the horror of war into a credible fictional narrative. This book, and the ones that precede it, is highly and enthusiastically recommended. Special thanks to guest reviewer Betty of The Betz Review for contributing her review of A Mortal Terror. Acknowledgment: Soho Press provided an ARC of A Mortal Terror for this review.